Is the tree in your driveway becoming a danger to your property? Did last night’s storm uproot a tree? Tree felling seems to be the solutions to these problems as these trees are now more dangerous than a boon to you! there is tree felling techniques to know. So you see, there are various reasons for felling trees. It could be that the tree is diseased, dead or damaged beyond help and is more a threat than a blessing. It could also be because of safety issues like a risk to surrounding property or the tree’s proximity to a structure. And of course, you may need to cut healthy trees to make furniture and other woodwork too. Whatever the reason, it’s essential that the right advanced tree felling techniques are used to ensure everything goes smoothly. It’s important that do your preparation so that you have the right equipment ready. You also have to check the surroundings to see if there are any significant obstacles to be careful about like overhead lines and buildings. Study the tree to determine the right felling direction. Take a look at the branches and how they grow, the wind direction and clear space behind the tree to make space for retreating. Place warning signs based on the tree’s falling direction and create your retreat path upon clearing the area surrounding the tree. Now check the fuel in the tank, and if it’s enough, start pruning the tree trunk! Remove all obstructing branches and twigs, preferably using a pulling chain while working from the top down. Before you start felling, check for conditions as you need to be careful if the timber is soft and discolored, or looks swollen or diseased. These are signs of rot infestation and weakened wood fibers wherein the tree has to be felled in its natural direction of fall. You can use a winch if you are not sure while felling the tree with an extra high stump is another option as rot infestation usually reduces higher up the tree. It’s when the tree is twig-free to shoulder height that you have to make the felling cut. There are two things to remember here- the hinge should be in the right direction with uniform thickness, and inserting the felling wedge or breaking bar before the tree pinches the guide bar. You also have to choose the right tree felling technique based on the tree size, slope and your best tree felling axe size. While a simple notch and back-cut method is typically used for felling trees, some trees require advanced tree felling techniques. A back cut involving cutting into the tree from behind can be dangerous with leaning or thick trees. ‘Barber Chair’ may develop, where the tree splits vertically up the trunk. It’s a bore cut that reduces the risk by using a chainsaw to drive a cut through the trunk center, at right angles to the fall’s direction. This leaves a part of the back part of the trunk strong enough to support the tree upright. The tree is released and falls when this support is cut upon completing the notch and back cut. This tree felling technique involves felling one tree into another and bringing both trees down. It is best for fallen trees caught in its branches; trees pushed against its natural lean and for partially cut trees that have reverted into the cut. However, the driving tree has to be tall and robust enough to take the second tree down and preferably have a lean that makes it naturally fall towards the other tree. This tree felling technique involves felling trees against its natural lean so that the tree drops away from property locations and overhead lines, or just positions the tree better for processing. A direct pull setup winch system is set up about two tree lengths behind the tree to pull it against its natural lean. If there’s not much space around the tree, then a winch-and-block system is a better option where the winch is positioned by attaching the rope as high up the tree possible for better tree fall control. If tree felling is inconvenient in urban areas because of lack of space and the surrounding infrastructure, crane removal may be a better option as it reduces the chances of property damage. The tree is felled in pieces while the crane secures the large section’s weight before cutting. You have to determine which tool to use based on the tree size. A telescopic foot breaking bar is best for small, thinning trees. It has to be inserted before completing the felling while you stand on the lever arm. Impact bars are similarly used, and also double as a striking tool ​when using felling wedges, for medium to large trees. Thee wedges have to be inserted before completing the felling cut and knocked in using an axe or impact bar. They should be made of aluminum or plastic to prevent damaging the chain if you accidentally cut into it. A winch and rope are best in extreme situations requiring maximum force and safety by attaching the line as high up the tree as possible maximize the effect. Sometimes these tools also double as felling aids to help bring down trees that remain standing even after a standard notch and back-cut. 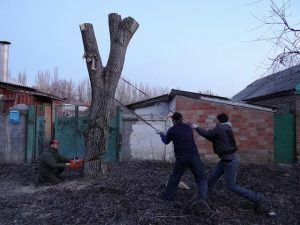 The metal breaking bars are slipped into the back cut, and human strength is used to pull the tree in the direction of the groove so that it can be felled. Wedges help hold the tree in place and when placed in the back cut, prevent it from sitting back on the cut. Even using a sledgehammer to drive it into the cut helps safely bring the tree down in the right direction. 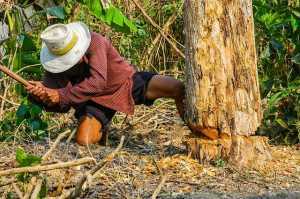 Now you know about the different advanced tree felling techniques, and the right tools to use, it’s up to you to choose and decide on the method and tool to use based on the tree condition, the urgency to fell the tree and the surroundings. What Size Log Splitter Do I Need? Different Type Of Axes : Which One Fit For You?